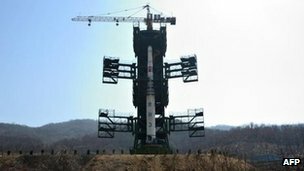 The rocket – seen by many as a banned test of long-range missile technology – was launched from north-west North Korea early on Friday. The US, Japan and South Korea say it flew only for a short time before breaking up and crashing into waters off the Korean peninsula. North Korea said its scientists were assessing what had caused the failure. North Korea says the aim of the rocket was to launch a satellite into orbit – a move marking the 100th anniversary of the birth of national founder Kim Il-sung. But the US and other nations say the launch constituted a disguised test of long-range missile technology banned under UN resolutions. In a statement, the White House condemned the launch, despite its failure. The UN Security Council is due to meet later in the day to discuss the launch. China, North Korea’s closest ally, has called for calm and restraint on the Korean peninsula. The rocket went up at 07:39 local time (22:39 GMT Thursday), South Korean officials said. Its intended flight path would have taken it south, to the west of the Korean peninsula between Japan and the Philippines. Both Japan and South Korea had threatened to shoot it down if it threatened their territory. But officials from several nations observing the launch said the rocket had failed. “Initial indications are that the first stage of the missile fell into the sea 165km (105 miles) west of Seoul, South Korea,” the North American Aerospace Defense Command (Norad) said in a statement. “At approximately 07:40 we confirmed that a certain flying object was launched from North Korea and fell after flying for just over a minute,” Japanese Defence Minister Naoki Tanaka said. South Korea said the rocket exploded into some 20 pieces and fell into the sea. “We are conducting a search operation to retrieve the fallen objects,” a defence ministry official said. Some five hours after the launch, North Korea confirmed it had been unsuccessful. “The Earth observation satellite failed to enter its preset orbit. Scientists, technicians and experts are now looking into the cause of the failure,” state-run KCNA news agency said. State television carried a similar announcement. The BBC’s Damian Grammaticas, who is one of a number of foreign journalists invited into North Korea for the launch, said the group had not been given any more information beyond that brief statement. The rocket’s failure, our correspondent said, is an embarrassment for the North Korean leadership. It will also come, analysts say, as a relief to many countries who are worried about North Korea’s potential to deliver weapons via long-range missiles. The US said that North Korea’s behaviour was of concern to the global community. “Despite the failure of its attempted missile launch, North Korea’s provocative action threatens regional security, violates international law and contravenes its own recent commitments,” a White House statement said. Pyongyang agreed in February to a partial freeze in nuclear activities and a missile test moratorium in return for US food aid. But that deal was put on hold last month after the North announced its rocket launch plans. Earlier this week reports also emerged from South Korea of a possible third nuclear test being planned by North Korea. North Korea conducted a similar rocket launch in 2009. On that occasion US and South Korea analysts said the rocket failed to reach orbit – but North Korea said it was a success. The failure of this launch could pose a challenge for Pyongyang, which is holding a week of high-profile events ahead of the formal celebrations to mark Kim Il-sung’s birthday on Sunday. The Workers’ Party held a rare conference on Wednesday and the country’s rubber-stamp parliament is due to meet on Friday. 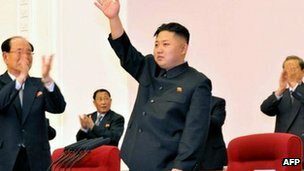 Both meetings are seen as formalising the transition of power to young leader Kim Jong-un following the death of his father Kim Jong-il in December 2011.